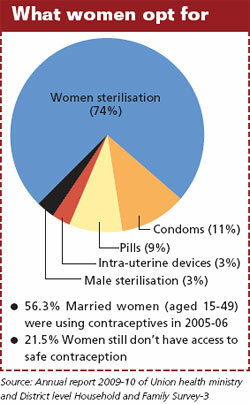 THE Union health ministry is again considering introducing injectable contraceptives in the family planning programme. The ministry has asked its Drug Technical Advisory Body (DTAB) to allow use of Depot Medroxyprogesterone Acetate (DMPA) in the programme. An earlier attempt to introduce it was withdrawn in 1995 after Supreme Court’s intervention. The contraceptive has side-effects, which include amenorrhoea (absence of menstruation) and weight gain. The long-term effect includes osteoporosis. Union health secretary Sujatha Rao, said most of the processes relating to introducing injectable contraceptives have been completed and that DTAB has to approve it now. She has since retired. Health activists and women’s organisations are up in arms. Brinda Karat, Rajya Sabha member and CPI(M) leader, wrote to health minister Ghulam Nabi Azad, saying the contraceptive would damage women’s health. “The programme cannot be focused on just population control; it should be about safe contraception,” she said. Women’s health groups have sent a memorandum to DTAB urging it not to approve DMPA sold under brand name Depo-Provera by US company Upjohn, now owned by Pfizer. It contains the hormone progestin and is administered every three months. It prevents pregnancy by inhibiting ovulation and thickening the cervical mucous, making it difficult for sperms to pass through. Mala Srivastava, gynaecologist with Delhi’s Gangaram hospital, said DMPA did not pick up in India because of its side-effects. She said condoms and gels are better because they reduce risk of sexually transmitted diseases. The Drugs Controller General of India (DCGI) approved Depo-Provera for marketing in the country in 1993 without the mandatory Phase-III trials. DCGI asked Upjohn to conduct a post marketing study, but it was termed inadequate by women’s groups who moved court. In 1995, after the apex court’s intervention, DTAB said Depo- Provera is not recommended because the country did not have proper infrastructure to support its use—women using it need to be monitored for sideeffects. But DTAB allowed its sale in the market. Ministry officials say now there is enough infrastructure to manage injectable contraceptives. Activists refute this. “There has been absolutely no change in the rural health infrastructure in the last decade. We still do not have enough hospitals and primary health centres are in bad shape,” said Anant Phadke of non-profit Jan Arogya Abhiyan in Maharashtra. Many non-profits are advocating use of Depo-Provera. “Our experience shows DMPA is safe. Since it is a hormone-based injection, it is bound to have side-effects but not very serious,” said Sandra Grass, director of the Mumbai branch of DKT International. Neeta Jha, general manager of Janani in Bihar, added that side effects like amenorrhoea are beneficial as women in rural India are anaemic and loss of blood can be controlled if menstruation ceases for some time. DKT and Janani run family planning programmes in Jharkhand, Bihar and Madhya Pradesh. Some other NGOs like Pariwar Sewa Sansthan and Family Planning Association of India are also promoting DMPA. Some of these nonprofits have worked with the United States Agency for International Development (USAID). “USAID pushes American products and privatises a large part of the family planning programme through NGOs,” said Kalpana, a health activist with Saheli, a women’s resource centre in Delhi. The memorandum to DTAB has also sought restrictions on NGO programmes that promote DMPA. But Sandeep Ghiya of DKT said many women in Pakistan and Bangladesh are using injectable contraceptives safely and there is no reason it should not be used in India.